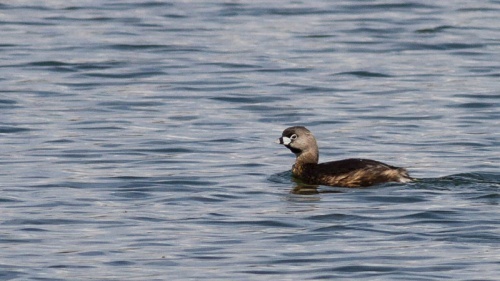 Adult Breeding: Dominant feature is heavy, parti-coloured bill, more than half as deep as it is long with decurved ridge and blunt end, mainly bluish-white with broad, black band in middle; white orbital ring round dark brown-red eyes also conspicuous. Forehead brown-black shading to dark brown on crown and green-brown on nape; sides of head and neck grey-brown contrasting with clearly defined black throat patch bordered with whitish line at sides. Upperparts dark brown, often with hoary look in fresh plumage; breast and flanks barred and blotched with dark brown on whitish ground, contrasting with usually conspicuous white under tail-coverts. In flight, wings mostly dark brown without any continuous patch of white as in Podiceps. Adult Non-breeding: Distinctive black markings lost. Bill yellowish, to dusky grey with dull greenish tinge, but no black band. Forehead and crown dark grey-brown; throat whitish, sometimes with traces of black; rest of head grey-buff with slightly darker line through eye. Neck, breast, and flanks grey-buff tinged reddish, to rich reddish tawny. 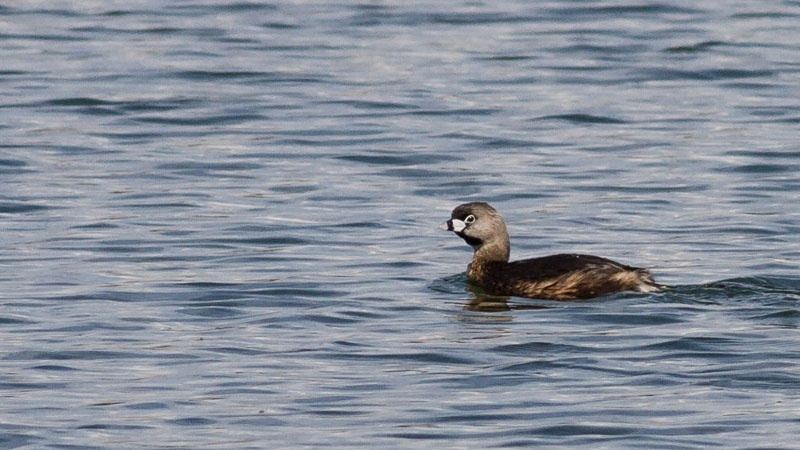 Otherwise as in breeding plumage, though white rear often more conspicuous. First-winter: May not be attained until near end of year, becomes like adult non-breeding, but bill greyish, white orbital ring still missing, and neck, breast, and flanks yellow-brown to grey-buff instead of reddish tawny. Well-vegetated, shallow, fresh waters, standing or slow moving, with ample marginal emergent and bottom growth of plants. Requires some open water, if necessary in form of channels intersecting marsh, or occasionally ponds in dense swamp growth. It could potentially be seen in any month and there are records of long staying individuals but new arrivals most likely to occur in late autumn. It may be seen on passage and in winter in wide variety of usually shallow waters. Generally wary and often skulking, particularly in breeding season, though this has also been characteristic of some vagrants to Britain. This is a species considered by the British Birds Rarities Committee and is certainly not recorded every year but as many as six have been recorded in a single year. 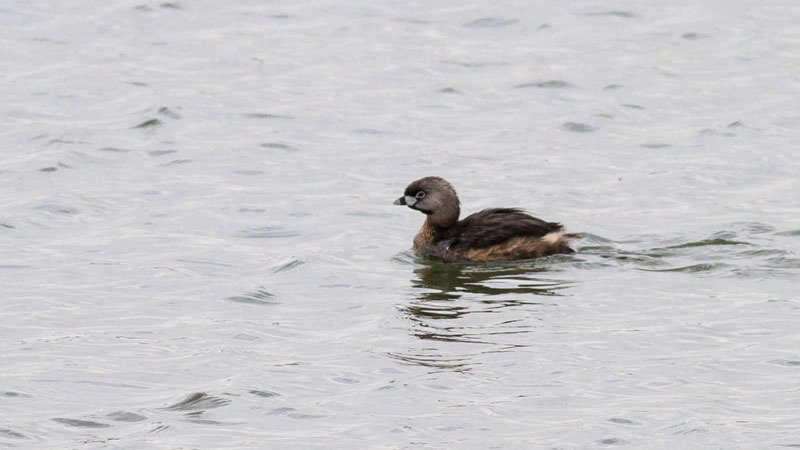 The first record for VC55 was of a summer plumage bird at Rutland Water on April 9th and 10th, 2013.